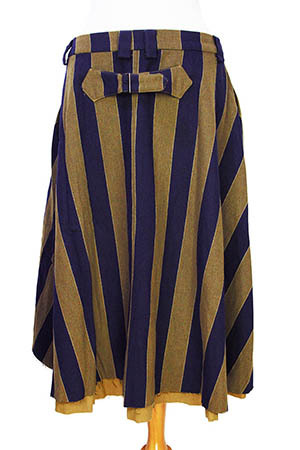 Aleksandr Manamis woven, striped skirt in 2 fabrics, 'striped, buckle skirt', in blue and army khaki stripes. Belt loops. Zip and button fly, with placket. Double pleats at front. 2 side pockets. Shorter at front with elegant transition to the longer rear. 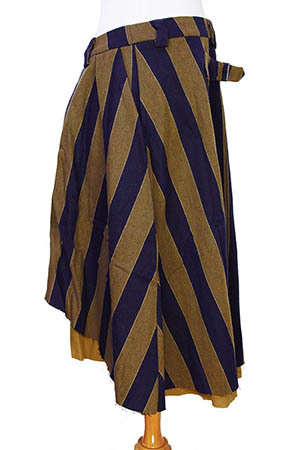 The under skirt is in heavy 100% cotton and lighter, desert khaki colour. At the rear there is a fabric half-belt with metal buckle. Absolutely beautiful piece of clothing!